Long time, no news- I know! It feels like weeks since I've properly had the head-space to sit down and write a full post here. Thanks everyone who has checked in on me - I really am okay. The reason for my absence is a good one rather than bad. As I wrote in early December, I've had the chance to leave my day-job for a little while, to focus in on my writing and drawing careers (as well as overcoming the anxiety that the job had managed to stir up in my soul.) It has now been one month, one week since my last day there, and I'm so happy to say that I'm starting to feel a lot more like me again. I've had time to work through my various ideas and projects, and have decided to see the above first draft through to completion as my first course of action this year. It's a romcom which follows a heroin with a lot of attitude. Landed in a situation she couldn't be less comfortable with if she tried, she navigates her way through unknown waters with sass, style (and a few shoe-related strops!) It was a toss up between this and some grim fantasy I've been working on- and after the year full of grief and sorrow we had in our house in 2018, I couldn't resist spending time writing something to make people laugh instead. 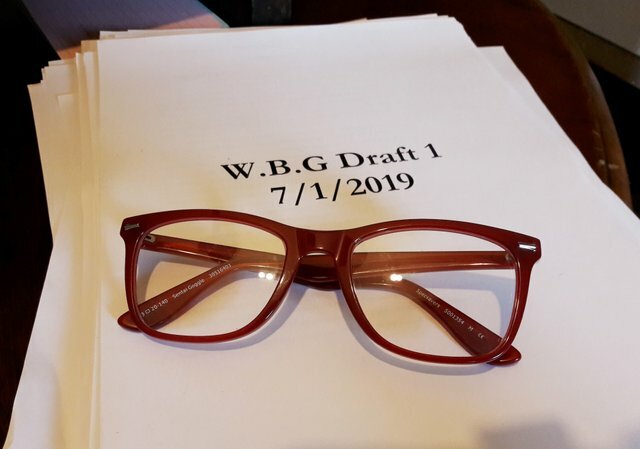 I've done a full read-through of the 71.5k words to refresh my memory, making notes as I go - and am now ready to delve into the first round of re-writed. The aim is to have this manuscript out on submission by the end of March, and then I have a three-book series planned out that I hope to get a decent way into before having to hunt down another job. I've also joined the Romantic Novelists' Association as part of their New Writers' Scheme. Last week I had the joy of meeting up with my local chapter, and had a lovely time hearing about some of the realities of being a full-time novelist! Part of the NWS is having the opportunity to get a full manuscript critique from an established author from our genre- so I'm excited to use that opportunity to my advantage. In simple terms- I haven't. Since leaving work, I've had a bit of a break from drawing, but I'm now gearing up to create some new pencil pieces to stock my Etsy shop with. I'm looking at doing a range of A5, affordable pieces - and looking forward to sharing them with you here soon! I'd like to do a series of wild animal portraits- so if you can think of any to add to my to-draw list- please leave me some ideas in the comments! So far I'v on wolves, otters, eagles, elephants, lions and whales! Anyway- there we are- that's what has been happening this end. A little bit of healing. A little bit of figuring out what's next... and now I'm planning on a lot of drawing, a lot of writing, and a lot of hanging out with you lovely lot too! Fantastic work on the writing! That’s no small feat. 🙂 Glad to hear life is treating you well! I an giggling in anticipation for this rom com of yours... I know it's going to be like spending the day with you with each page turn... That alone makes it worth it!!! Hello @eveningart, thank you for sharing this creative work! We just stopped by to say that you've been upvoted by the @creativecrypto magazine. The Creative Crypto is all about art on the blockchain and learning from creatives like you. Looking forward to crossing paths again soon. Steem on!